Fractions are used in math to represent many different kinds of mathematical data. The fraction 3/4 represents a ratio (three out of four pieces of pizza had pepperoni), a measurement (three-fourths of an inch), and a division problem (three divided by four). In elementary math, some students have trouble understanding the complexity of fractions and their processes. Adults, however, have been exposed to different learning methods and experiences and have developed more ways to comprehend fractions. These new skills provide ways for an adult to brush up on fractions and to learn new mathematical concepts and applications. Look at the fraction 3/4. The diagonal slash mark, commonly called a forward slash, is a solidus and separates the two numbers. Find the numerator. The numerator is 3 and represents the parts of a whole, e.g. three out of four pups were black. It also represents the dividend in a division problem, e.g. three divided by four. Find the denominator. The denominator is four and represents the whole part, e.g. the whole litter of pups. It also represents the divisor, the number doing the dividing. Look at the following list of fractions: 1/2, 6/5, 1 1/5, and 17/1. Select the fraction that represents a proper fraction. A proper fraction will have a numerator smaller than the denominator. In this case, 1/2 is a proper fraction. Select the fraction that is an improper fraction, i.e. a fraction with a numerator larger than the denominator. Fractions written like this are not wrong but instead are shorthand ways to write mixed numbers. The fraction 6/5 is an improper fraction. Find the fraction that is a mixed number. A mixed number contains both a whole digit and a fraction. 1 1/5 is a mixed number. If the mixed number were to be written as an improper fraction, it would be 6/5. Add 3/7 + 2/7. The denominators are the same, so add the numerators first: 3 + 2 = 5. Keep the denominator the same. The answer is 5/7. Subtract 9/10 – 8/10. Again, the denominators are the same, so subtract the numerators and leave the denominator the same: 9 – 8 = 1. Write the 1 over the denominator for the solution, 1/10. Add 2/5 + 4/7. The denominators are now different. In order to subtract these two fractions, they must represent the same whole, i.e. you cannot take circles from squares. Instead, convert the fractions so that they are equivalent and have the same denominator, or whole. Find the least common multiple (LCM) between 5 and 7, i.e. the same number both 5 and 7 divide into evenly. The easiest way is to multiply 5 by 7 for a product of 35. Multiply the numerator 2 by the same factor used to determine the LCM, e.g. 2 x 7 = 14. 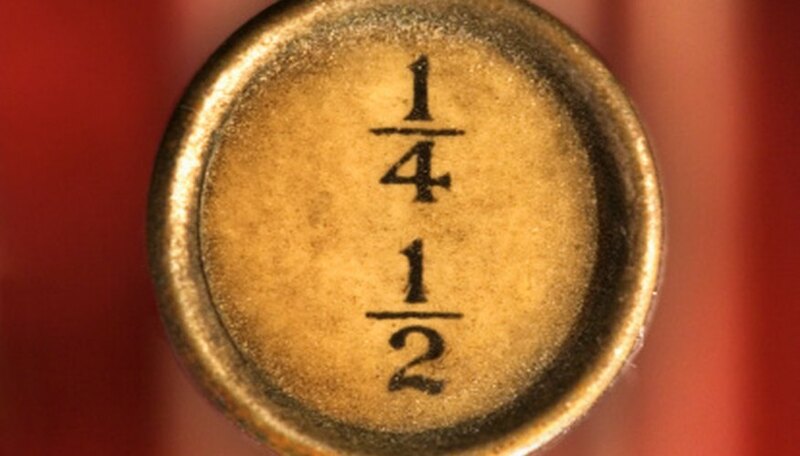 The equivalent of the first fraction is 14/35. Multiply the numerator 4 by the same LCM factor used to convert the 7 to 35, e.g. 4 x 5 = 20. The equivalent of the second fraction is 20/35. Now that both denominators are the same, add normally: 14/35 + 20/35 = 34/35. Subtract 6/8 – 9/10. Find the LCM to make equivalent fractions with the same denominator. In this case, both 8 and 10 go into 40 evenly. Multiply the numerators by the factors used to obtain the like denominators: 6 x 5 = 30 and 9 x 4 = 36. Rewrite the fractions in their equivalent forms: 30/40 – 36/40. Multiply the fraction 3/4 x 1/2. To do this, multiply both numerators and then both denominators. The answer is 3/8. Divide 4/9 ÷ 2/3. To do this, first flip the second fraction, called the reciprocal, and multiply the two fractions. Rewrite the problem to reflect the reciprocal of the second fraction and the operation change: 4/9 x 3/2. Multiply as normal: 4 x 3 = 12 and 9 x 2 = 18. The answer is 12/18. Both numbers divide by 6 for a fraction in simplest form: 2/3. Compare the fractions 6/11 and 3/12. To compare fractions, use a process called cross-multiplication to see which fraction is larger. Multiply 12 x 6 to get 72. Write 72 over the first fraction. Multiply 11 x 3 to get 33. Write 33 over the second fraction. By comparing the two numbers above the fractions, it is clear the 6/11 is larger than 3/12. Convert 8/9 to a decimal. Divide the numerator by the denominator: 8 ÷ 9 = 0.8 repeating. Convert 10/7 to a mixed number. Divide the numerator by the denominator. The answer is 1 with a remainder of 3. Write the 1 as a whole number and the remainder over the original denominator: 1 3/7. Convert 5 9/10 to an improper fraction. Multiply the denominator by the whole number and then add the numerator: (10 x 5) + 9 = 59. Write the answer over the original denominator: 59/10. Convert 3/4 to a percent. First, divide to convert the fraction to a decimal 3 ÷ 4 = 0.75. Move the decimal to the right two places and add a percent sign: 75%. Home School Math: Why are Fractions so Difficult to Learn? Fuller, Tuesday. "How to Learn Fractions for Adults." Sciencing, https://sciencing.com/learn-fractions-adults-8298192.html. 24 April 2017.